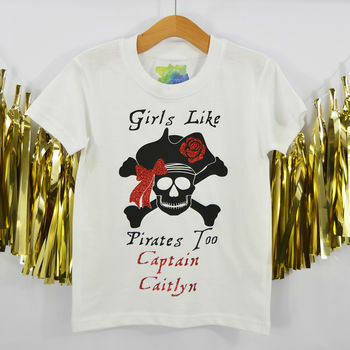 A brilliant gift for any Pirate Fan, the Girls Like Pirates Too T-Shirt by Rocket & Rose. A really fun slogan t-shirt which can be personalised with a Pirae name to suit your little Pirate fan or can be printed without a name. The Girls Like Pirates Too T-Shirt is available as a short sleeved t-shirt in a range of different colours & print choices. So you can choose the design to match your little Pirates's wardrobe! The print option you ae asked to choose is the colour of the bow, rose & name on the t-shirt. The pirate image will be either white or black, depending on the colour of the t-shirt you would like.